My current favorite song to run to? “My First Kiss” by 3OH!3. I really hate the band for doing that lyric “Do the Helen Keller” but this song is so addictive and a great one to run to. I still won’t ever buy one of their albums, though. Lunch had to be eaten in two stages. I ate half before I picked my brother up from his conditioning drills, and half afterwards. 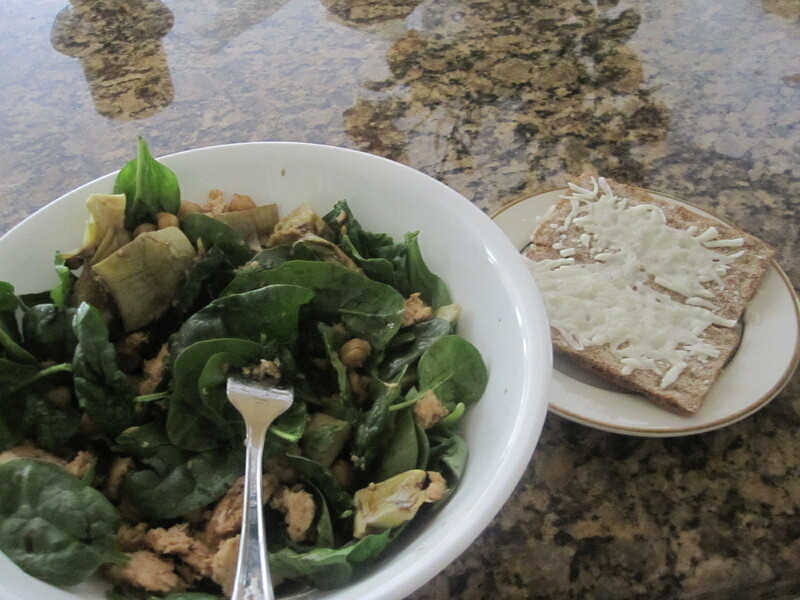 I combined a handful or two of baby spinach with 1 pack Starkist Salmon, handful of artichoke hearts, and 1/2 cup chick peas. I dressed my salad with balsamic vinegar and paired it with two Wasa Crackers topped with melted Veggie Shreds (I also put some salsa on top). For dessert, I ate a very mushy, very sweet plum. After picking up my brother and finishing up lunch, I settled onto the couch to watch a few episodes of Criminal Minds…and ended up taking an hour and a half long nap! It felt amazing although I was still very groggy afterwards. I probably could have slept the rest of the afternoon away! 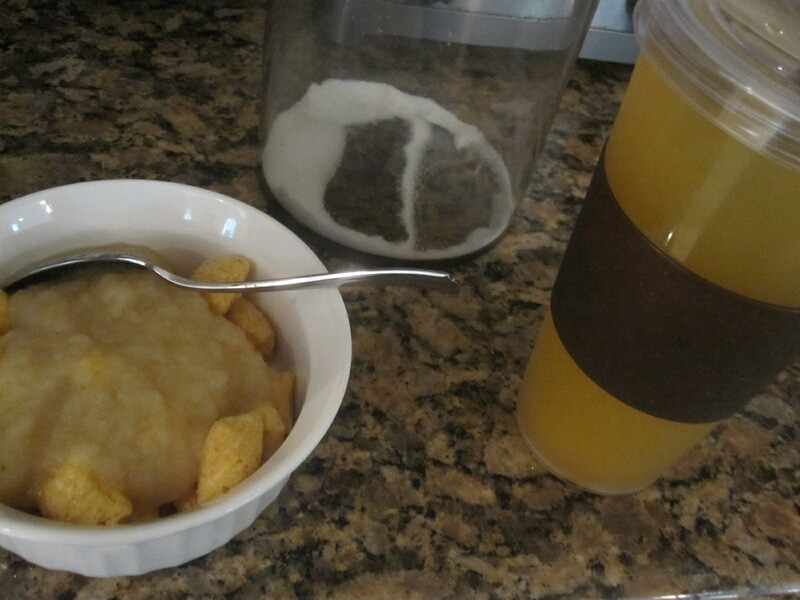 I did want to get a good run in before dinner (plus my tummy was acting up), so around 5:00 I ate a pre-workout snack of 1 c Peanut Butter Puffins and 1 tin Mott’s No Sugar Added Granny Smith Applesauce. I love this snack so much! Crunchy and sweet, and it kept me fueled. I also drank a bottle of vitaminwater zero. My run was awesome, despite having to stop twice. Once, because mentally I thought I should stop; however I automatically realized my body didn’t need to stop and I started right back up again. The second time was near the end of my run and I started to get affected by the heat. It was a HOT one today in CT and my body was not happy with me! But after I pushed on, I realized I was going to complete more than 4 miles in almost 40 minutes flat! I should probably get a Garmin or some other watch to really check out what my splits are, I run extremely fast! Towards the end of the run, my body started to hurt. My stomach felt like people were stabbing me in the gut, and I stumbled into the house and sucked down a bottle of water. I finally felt normal enough to shower and throw together a satisfying but light dinner. My mom had prepared meatloaf, but my stomach was in no mood for meat! It wanted eggs, of all things. So I threw together an egg pizza!!! Preheat oven to 350. Spray both sides of tortilla with cooking spray, place on aluminum-covered baking sheet, and bake until just crispy or the ends start to turn up and brown slightly (about 8 minutes give or take). Remove from oven, and top with sauce and shreds. Return to oven for only about 3 minutes or so, just until the cheese starts to melt. Remove from oven, and crack both eggs over top of pizza. Now, be warned: one of my eggs REFUSED to stay on so I had to smush it on there. I recommend before cracking the eggs to fold the corners of the aluminum foil up until it creates a barrier for the eggs, so they can’t slide around as much. Return pizza to the oven and cook until egg whites are fully set (around 10 minutes). 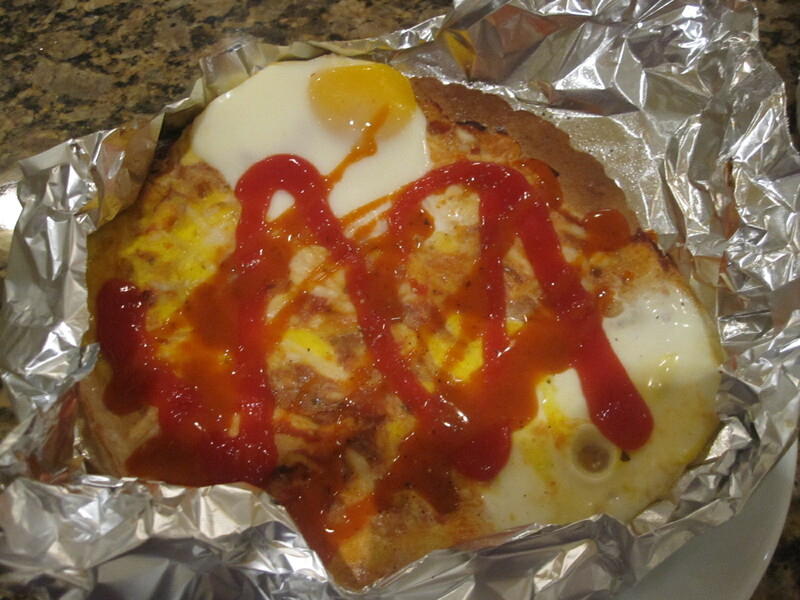 When eggs have set, remove from oven, top with as much ketchup/hot sauce as you like, cut into four pieces, and enjoy! This was awesome. I didn’t think it would get much better than my Buffalo Chicken Pizza from last week, but dammit this came pretty close! I think because I can have this one for breakfast, lunch, and dinner. For dessert I ended up just having two giant bowls of cherries. I had to throw away two hefty bags because the bottoms got wet, ruining a lot of the cherries! 😦 Is there anything more devastating to a fruit lover than a fruit opportunity wasted?